I spent the past week in the snowy mountains. Upon returning home the trees have burst out with flowers, shoots of grass have sprouted, and the sun has warmed the earth. I’m feeling green. The color of spring. 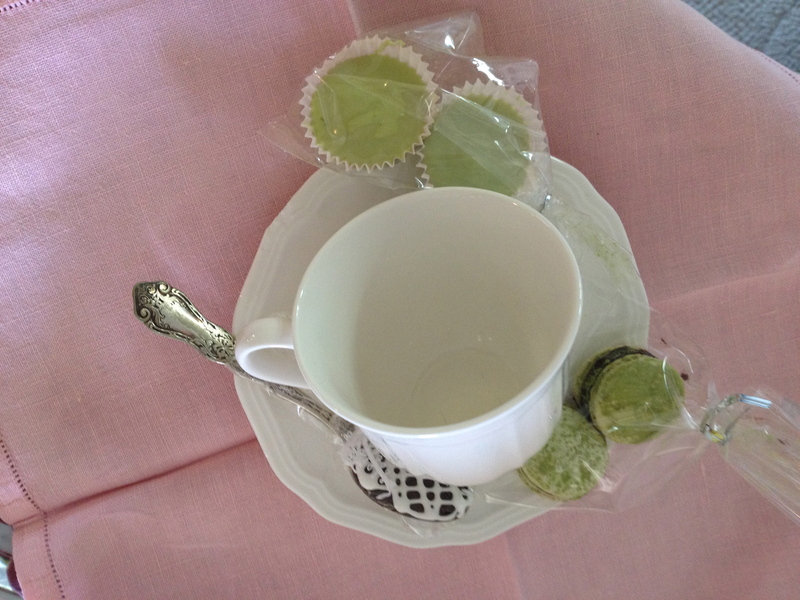 Two months ago for the tea party I made goodie bags with Matcha green tea. 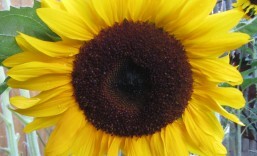 I started drinking it during menopausal years for an energy boost. According to Wikipedia Matcha green tea is a finely milled or fine powder green tea. Japanese tea ceremonies focus on the preparation, serving, and drinking of matcha. Matcha is used to flavor and dye foods such as sobi noodles, ice cream, pastries and even a Japanese candy called wagashi. Matcha is made from shade-grown tea leaves. The preparation of matcha starts several weeks before harvest & can last up to 20 days, when the tea bushes are covered to prevent direct sunlight.This slows down growth, stimulates an increase in chlorophyll levels, turns the leaves a darker shade of green, and causes the production of amino acids in particular L-Theanine. Only the finest tea buds are hand-picked. After harvesting, if the leaves are rolled out before drying, the result will be auokuro tea. If the leaves are laid out flat to dry, they will crumble somewhat and become known as tencha. Tenchacan then be de-veined, de-stemmed, and stone-ground to the fine, bright green, talc-like powder known as matcha. It can take up to one hour to grind 30 grams of matcha. Now I know why it is so expensive. I purchased 1.5 ounces for $14. 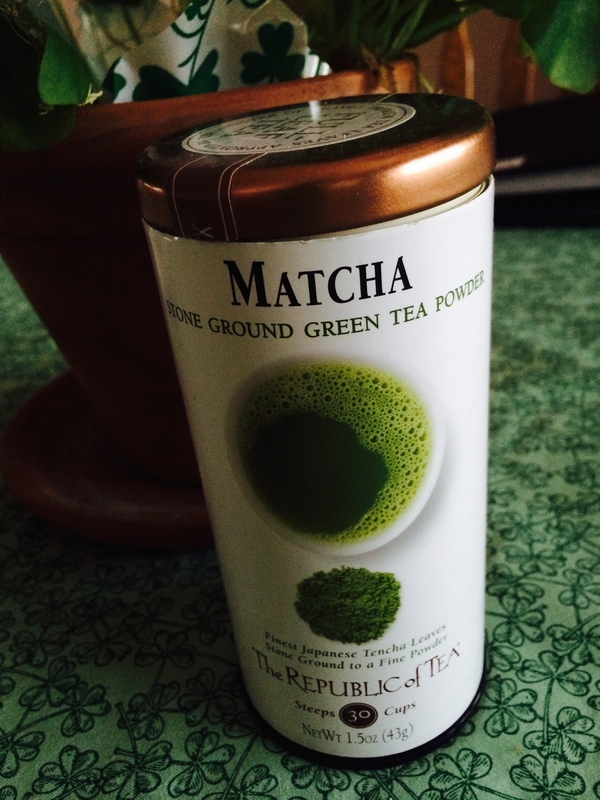 My fellow blogger, jothetartqueen has made many recipes with Matcha green tea. She is a trained chef and I appreciate her talents and daring skills. 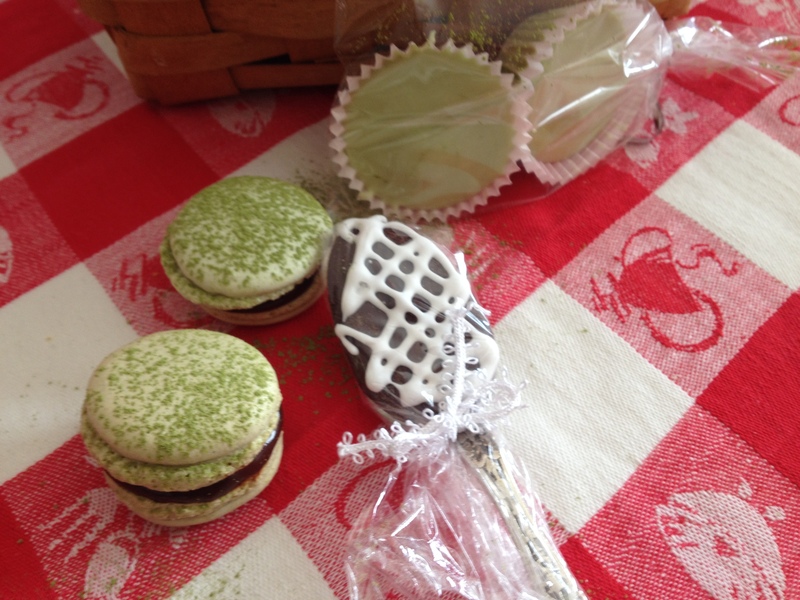 For my challenge I made macarons and candy laced with matcha.I’ve made macarons before check out this earlier posting. Process the almond meal and icing sugar together. In a mixer, whip half the egg whites to soft peaks. Meanwhile, in a saucepan bring the water and sugar for the syrup to 117C (or 242F) on a candy thermometer. Once ready, slowly add the boiling syrup to the egg whites and continue to whip on medium speed until they thick and shiny and are completely cooled (about 10 minutes). 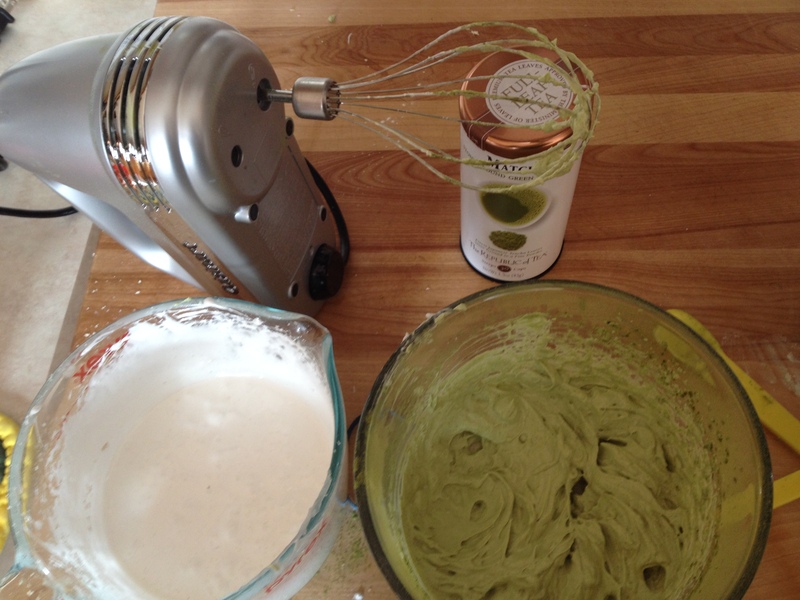 At the final changes of whipping the meringue, and add the matcha tea powder. Mix the remaining egg whites to the sifted almond mixture and fold into the meringue in four parts. 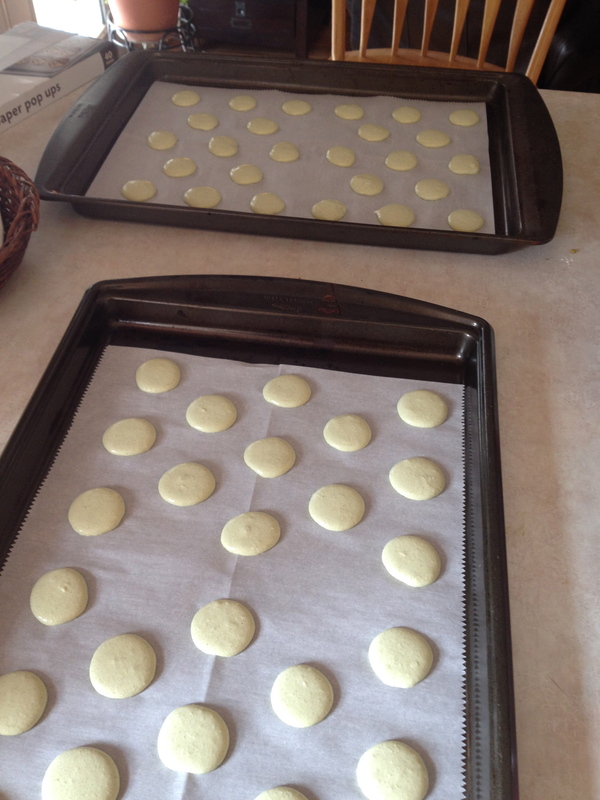 Pipe macarons on lined baking sheets. Double up your baking sheets if you do not have professional grade quality. Let your macarons sit at room temperature for 30-60 minutes. Bake at 140C or 280F for 15-18 minutes. Fill with ganache or filling of your choice. Refrigerate to set. Heat cream until bubbles form around the edge of the pan. Pour over the chocolate. Let sit for 2-3 minutes and then stir. Let cool then transfer to the refrigerator to thicken. For the filling, place pistachios and salt in a food processor and blend until it starts coming together in a ball. This could take up to 15 minutes and you’ll have to scrape down the sides of the bowl often. If you’ve ever made your own nut butter, it’s basically the same process. With the motor running, add some oil slowly until the nut butter begins to thin out. Do not use too much though as you don’t want it to be runny. About the consistency of commercially prepared peanut butter is good. Add a pinch (or two if you like) of Matcha to the nut butter and blend again until well combined. Set aside. Place 12 mini cupcake wrappers into a mini cupcake baking tray. Note, I only got 11 1/2 cups using this recipe! 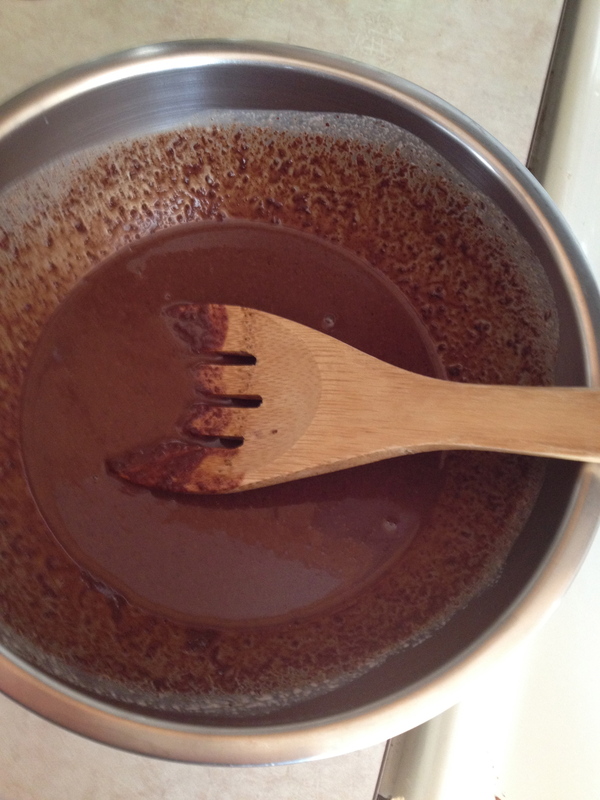 For the outer shell, melt chocolate in a heatproof bowl over a pan of simmering water, stirring constantly. Do not let the bowl touch the water, and do not get water into the chocolate. When chocolate is melted and smooth, remove from heat, immediately sift over matcha and stir until well combined and matcha is dissolved. Do this in small amounts so you can ensure you get the green color you want. If you put in too much matcha, you might get an unappealing dark green color that no one wants to eat! When you reach your desired color, place about 1 even teaspoon of melted chocolate into each mini cupcake liner. Using the back of a small spoon, bring the chocolate up the sides of the paper liners and smooth down the bottom to make it flat. Repeat for each liner. Place the tray in the refrigerator for about 15-20 minutes to set. 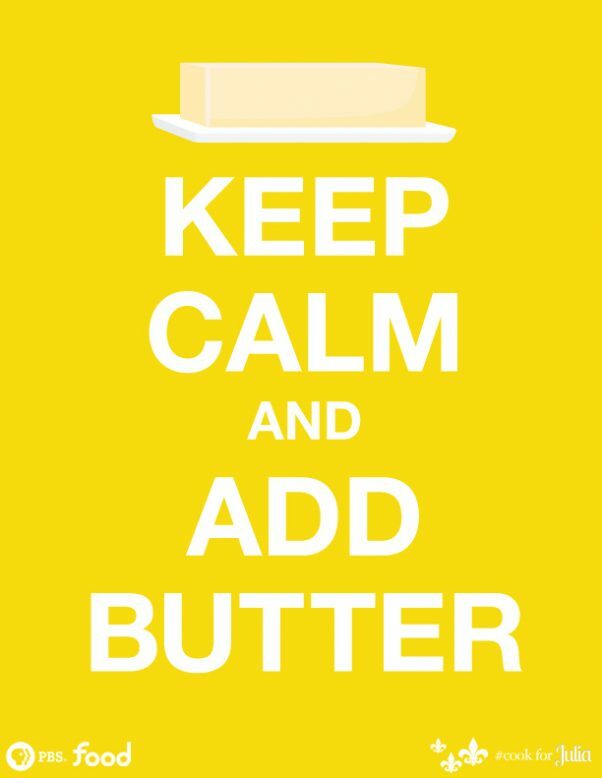 Measure 96 grams of pistachio butter and transfer this amount to a clean bowl. Sift over the icing sugar and stir (or use your hands) to thoroughly combine. Form 12 balls from the pistachio butter/icing sugar mixture using about 1 teaspoon, just slightly rounded, each. Place on a clean surface. Take out the baking tray from the refrigerator, ensure the chocolate is hardened, then slightly flatten the pistachio balls with the palm of your hand and place 1 ball into each chocolate cup. Pour 1 teaspoon of chocolate (you may need to re-melt it) on top of each pistachio ball, ensuring the filling is completely covered. To get a smooth top, do not use a spoon or knife to flatten or spread it; just pick up the tray and tilt it around (you may need to tap it gently on the countertop) to get the chocolate to cover the filling and you should end up with a completely smooth top. Repeat for each cup. Refrigerate until set, around an hour. To serve, let the cups come to room temperature and for a more intense matcha flavor, dust some matcha over the top of the cups. 1. Loose green tea that is steeped, cannot be blended into Matcha tea. I tried doing that before reading the Wikipedia article. How silly! A coffee and tea shop owner thought it was a good day also. I was also surprised she had never heard of matcha green tea. Only a few shops carry Matcha green tea. I have found better prices on the internet but haven’t delved into purchasing it as yet. I have purchased “shots” of Match green tea that was added to a smoothie which was yummy. 2. Macarons are fun to make, now that I have mastered them. I whipped out the batches in about 2-3 hours. I sprinkled the Matcha tea atop each cookie for a nice accent. 3. The candies were actually pretty easy to make. Unsalted pistachios can take a while to find, look somewhere where they have bulk items. These candies are so rich, they don’t need any additional salt so try to get the unsalted type. I had to make adjustments to the amount of powdered (icing) sugar so make sure to taste it as you mix it. 4. These treats are quite rich, so eating one or even half of one was plenty for me to sample. They made nice treat bags. What a fun way to use tea! Another culinary adventure!